Once upon a time, long ago in the days when I was a teenager, the Cultural Studies lesson was the absolute highlight of my school week. Not, I hasten to add, because I was in love with the lessons, the teacher, or their content, but simply because it entailed walking across the park from my ‘all girls’ school, to THE BOY’S SCHOOL. Oh Yes! I loved ‘Cultural Studies’. A staggering amount of preparation would go into this weekly class and it most definitely had nothing to do with homework, learning, or research in any shape or form.Hour upon hour was spent plotting and planning what I would wear for the all important following days Cultural Studies class. How cool could I be? Would I be able to squeeze into my far too tiny skirt bought on the Portobello Road? Would the guy I really, really, fancied be there? Or, I’d pray, would he even notice me? Such teenage angst in the run up to my cultural studies…. The evening prior to the CS class would be devoted entirely to ‘personal maintenance’. This included plucking my eyebrows, face packs, cucumber on eyes, squeezing spots…. re-doing my black chipped nail varnish, and colouring my hair, using either henna, or the handily available bleach toilet cleaner to add those much desired ‘sun kissed’ streaks to my dark brown tresses. Further time would then be spent in front of the mirror, perfecting ‘the look’ before I could be completely satisfied that I had done all the necessary prep for my next days class. I have absolutely no recollection whatsoever of learning anything during those two years of CS classes, but it was a perfect opportunity to get to meet BOYS, and that was all that mattered at the time. These days I take my Cultural Studies far more seriously. I could even be described, heaven forbid, as something of a swot. I spend hours reading up on stuff, observing, listening, asking endless questions and generally trying to discover as much as I can about my new country. Coming to live in Indonesia has opened up a whole new world for me, visually, culturally and aurally. As I sit writing this, I can hear the six Mosques that surround our apartment, ringing out their Call to Prayers. It is the most extraordinary sound, especially if you have never experienced it quadrophonically before. In my previous life, the Church bells peeling out on a Sunday morning were about as near to a ‘religious’ noise that I ever got to hear. 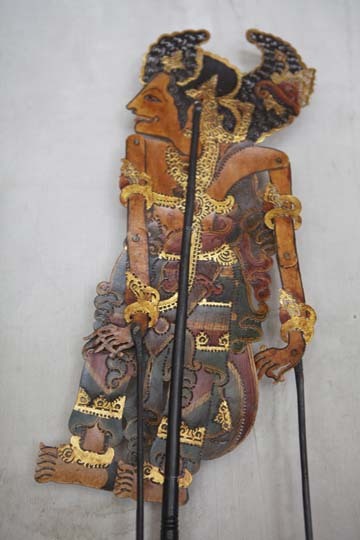 Indonesian culture is deliciously rich and vibrant and interestingly diverse. Having been shaped by its original indigenous peoples and their customs, it has also soaked up multiple foreign influences from those who have landed on these shores and tried to claim it as their own. The Indonesian Archipelagos position on the globe has meant that in the past especially, it was a prime trading route between the Far East, and the Middle East, and this has resulted in many cultural practices and strong influences from various religious backgrounds, predominantly Islam, Hindu, and Buddhist. Despite all of this, Indonesia has still managed to maintain its own strong, cultural heritage, but there’s no doubt that the increasing influence from the West is slowly creeping in via the usual suspects; The ubiquitous Starbucks, KFC, McDonalds, Pizza Hut, Wendy’s all of whom now have their great fat foot in the door. 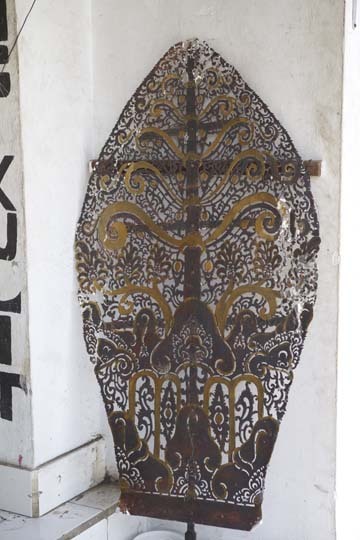 Traditional Indonesian culture is based around its Arts and Music. 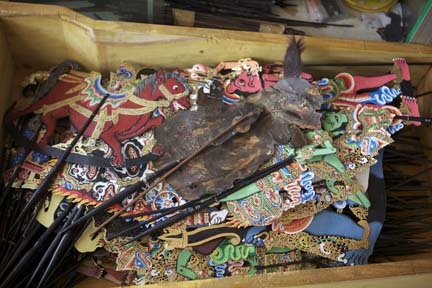 Dance and Wayang shadow puppets shows are still performed and not just solely for tourists. The tradition is kept alive by a love of folklore and mythological legends and the telling of stories. 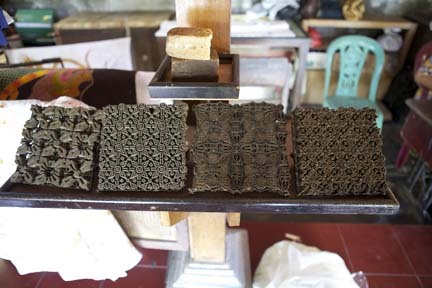 Carving, whether in wood or stone is huge business here. Some of it I might add is simply awful, especially the stuff made for the mass tourist market, but the real deal is exquisitely beautiful. Stunningly crafted carved doors and screens made from teak, and such fabulous furniture that I find myself inventing fantasy rooms to put it into. Batik, something that I admit in the past to having a strong dislike to, I now love. I’d only ever seen rather tasteless brown dull examples of it before. Now I realize there is a multitude of designs and colours and there is something to suit all tastes. Having seen some quite funky examples of it in Jakarta, I am now inspired to find out more and possibly work with someone to create some ranges for my design company. 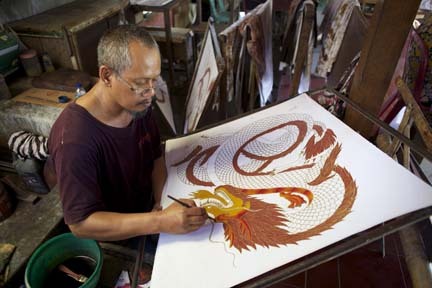 Indonesia’s culture is not solely about its Arts, crafts and Music. Culture is the living, breathing spirit of this continent and what is happening right now within it. I am just as intrigued about a visit to the supermarket, as I am in visiting a Museum. Both of them hold the answers to me of what it is that makes up this astonishing place. For me, difference is exciting. Difference should be celebrated, and how different is my life now, in a country thousands of miles away from where I was born where I am having to learn something new everyday. Never in my wildest dreams did I think that I would have to spend around 15 minutes trying to work out which soaps in the shop I can buy which wont make my pale skin even whiter, nor which shampoos will not add a raven black lustre to my peroxide blonde hair. Buying face creams I have the same dilemma. Pretty much all the face and body creams here have whitening agents in them, some with mercury as the main ingredient. And if creams, soaps and shower gels and chemical peels aren’t enough, ladies can resort to ‘Skin Whitening’ injections – a course of 36 injections (more if you eat a lot of shellfish and fish apparently) which will need repeating every 2-3 months. All of this in an attempt to achieve ‘white skin’. The irony is of course, that in the west we lie out in the sun scorching ourselves, risk our lives roasting ourselves on skin cancer inducing sun beds, and slather stinky self-tanning crap over our bodies to get that lovely ‘tanned’ look, but mostly end up looking bright orange with hideous streaks all over as in my case. Brilliant blog – one of my faves!! Love having such a vivid insight into such a different world. Amazing how time and maturity changes things, isn’t it? I loved my school studies, too, as long as there were cute boys to enjoy. Now I’m less distracted, married, and able to more thoroughly absorb and enjoy the pursuit of knowledge (culturally or otherwise). You Gorgeous Woman! I adore you too! – I still check in the mirror, but these days there is no way that I could fit into ‘the tight, tight skirt’ or even entertain the idea of using the toilet bleach on my hair! There is a lot to be said for ‘maturity’ however much I want to ‘kick the traces’ and fight it.